The AFL has released its 2016 participation figures. THE ESTABLISHMENT of the new AFL Women’s competition is the major reason behind an enormous spike in participation numbers, according to latest figures released by the AFL. A 56 per cent increase in female community club teams boosted the total female participation by 19 per cent to 380,041. Overall participation across all levels of the game jumped 12.5 per cent to a record 1,404,176. 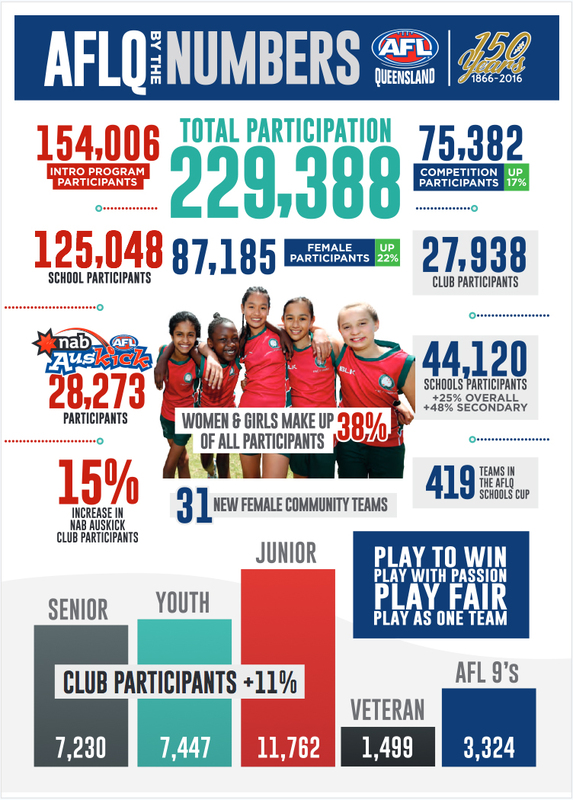 In announcing these figures, AFL general manager of game and market development Simon Lethlean revealed that 354 new women’s and youth girls’ community clubs had been established, for an overall tally of 983 clubs. “The growth in female club participation illustrates the importance of having an elite national competition for players to aspire to,” Lethlean said. Participation numbers grew all over the country, taking a significant leap from the 2015 tally of 1,247,575. More males also played the game, with a 7.3 per cent increase in community football participation and a five per cent rise in the number of teams across all competitions. Lethlean enthused that these results highlighted the game’s “appeal to people regardless of their age, gender or background”. NAB AFL Auskick numbers also expanded by 6.9 per cent, with almost 196,000 children involved. Tas – The number of Tasmanians playing football reached a record 40,139, highlighted by enormous growth in female club participation. NSW -Total participation in 2016 grew by 10.4 per cent to 237, 549. Female participation grew by 23 per cent to 85,919; five times the number of women who participated in 2010. Participation in NAB AFL Auskick grew by 18.2 per cent. There are now more Auskick participants in NSW/ACT than any other state. SA – Australian Football participants in South Australia increased by six per cent in 2016 to a total of 151,034. This included an increase in female participation of 13.5 per cent. After a three per cent increase in 2015, NAB AFL Auskick participation numbers increased by 14.5 per cent in 2016 as the overall tally pushed through the 9000 barrier for the first time. WA -Total participation in Western Australia grew by 34.6 per cent to 302,687 in 2016, highlighted by a 5.2 per cent increase in NAB AFL Auskick. Club football participation grew by 7.7 per cent to more than 67,000, including strong growth in female competitions. Queensland’s love of Australian Football continues, with census figures announced today revealing a six per cent growth in participation for the state in 2016. 229,388 men, women and children pulled on a Guernsey this year, compared to 216,381 in 2015. AFL Queensland CEO Dean Warren said key findings include a 16.87 per cent increase in competition participants across club, school, and AFL9s. 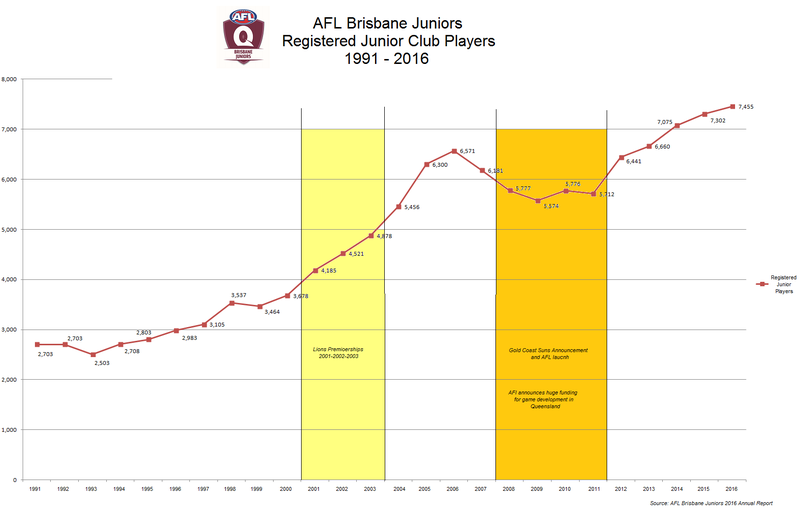 AFL Brisbane Juniors reported that Season 2016 saw 7,455 players and 521 teams competing in their competitions. 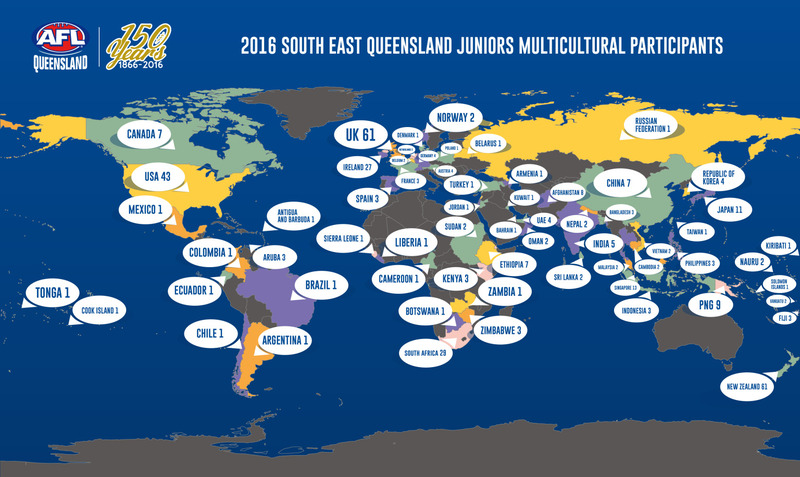 AFl SEQ provided a graphic indicating where participants in its junior progams are from. The health of Australian Football in Victoria is in good shape with 2016 census results showing more than 160,000 Victorians lacing up the boots in community club competitions across the State. With the establishment of 180 new community teams in 2016, club football participation rose by eight percent, up from 148,000 players in 2015. The number of females picking up the football in 2016 continued to rise, with the establishment of 100 new female club teams this year alone taking it to a total of 355 dedicated female teams providing over 9,000 females the opportunity to play our indigenous sport in a community club setting. Female youth club team numbers almost doubled this season with a 48 per cent increase in participation of Under 18 girls, while female numbers in NAB AFL Auskick, expanded to 4,621. FOOTBALL participation in Western Australia has reached a record 302,662 following the official release of 2016 AFL Census figures today. The total number includes a 27% increase on WA’s 2015 participation total, plus an additional 15,570 captured for the first time in the AFL Census under one-off club-based programs such as the Nicky Winmar Cup, Kirby Bentley Cup and remote and regional carnivals. WA football participation was the highest for any State outside Victoria and made up 20.4% of Australia’s overall total of 1,404,176, which increased nationally by 12.5%. The number of players that joined football clubs in WA increased by 7.7% to more than 67,000 which included 5.9% growth in Youth Football and a 61.3% increase in the number of females playing club football. The total number of female club football teams in the State almost doubled from 84 to 157 to accommodate the strong growth in female club participation. 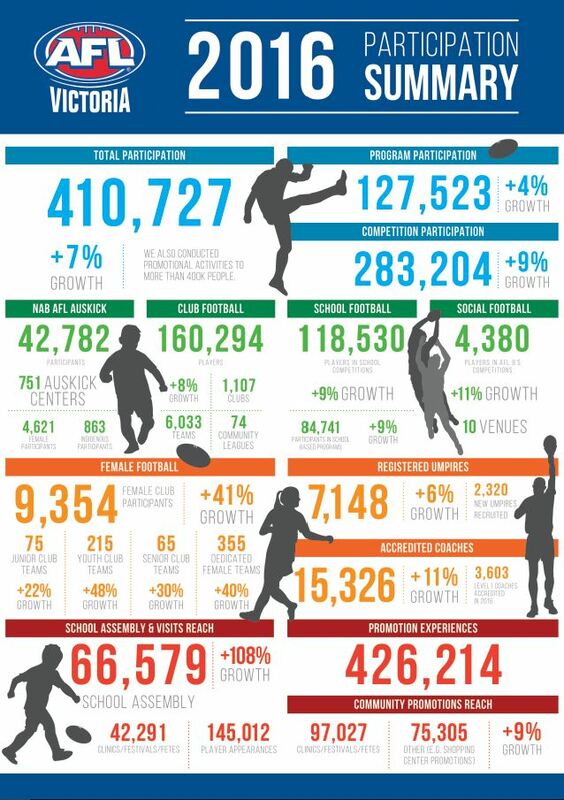 Another important area to record solid participation growth was Junior Football, which increased by 9.3% (30,940 participants) due to improved transition of Auskick participants. 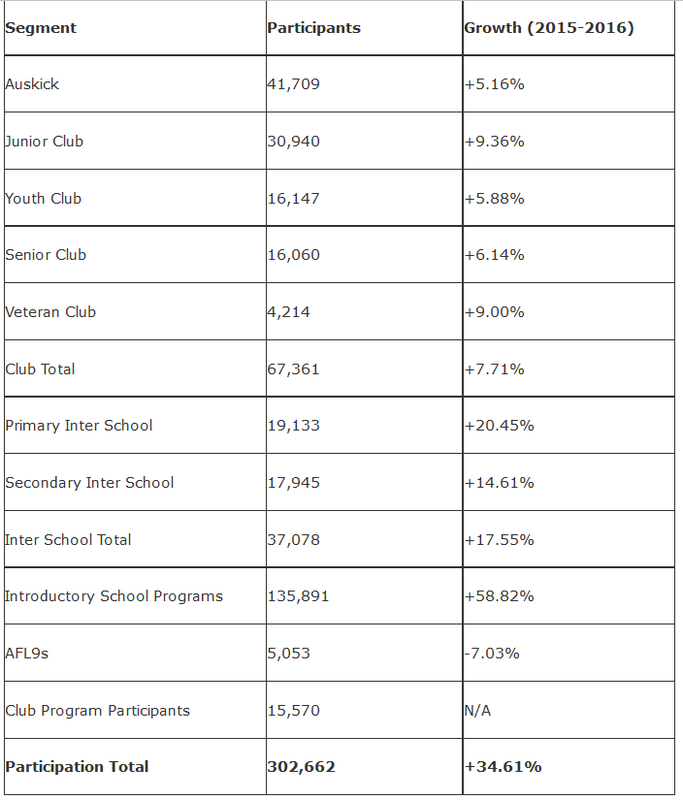 Auskick numbers also increased in WA by 5.1% to 41,709 participants. Registered players in NSW and the ACT are up 10.4 per cent to 237,549 with Auskickers leading the way with 61,037 (more than any other state or territory), an increase of 18.24 per cent on last year. There are nearly 86,000 female players in NSW and the ACT, an increase of 23 per cent on 2015. The women’s AFL has grown 400 per cent nationally since 2011. The competition has grown by over 33% in 5 years.